As for décor, there is a wide range of decorations, such as white satin draping, chiavari chairs and a wrought iron arbor. You can also rent audio visual equipment, which includes a portable sound system, microphones, staging and other gear. If inclement weather threatens your outdoor wedding, you can rent heat lamps and umbrellas. Tents, coming is various custom sizes, are also available for rental. The Conservatory's executive chef can customize menus for your reception dinner, whether you prefer flavorful, rich meals or crispy, light foods. You can also choose from a wide selection of preferred vendors, such as florists as well as other businesses that specialize in invitations, equipment, cakes, hotels and other services. 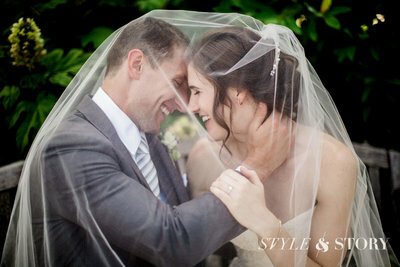 Probably your most important vendor is the photographer you select for your wedding day. Instead of worrying about your wedding photos, choose Style and Story to capture your day and help create memories that will last a lifetime. Contact us and learn more about our wide range of services. Although prices vary, according to womangettingmarried.com, the average base price is about $22,000. 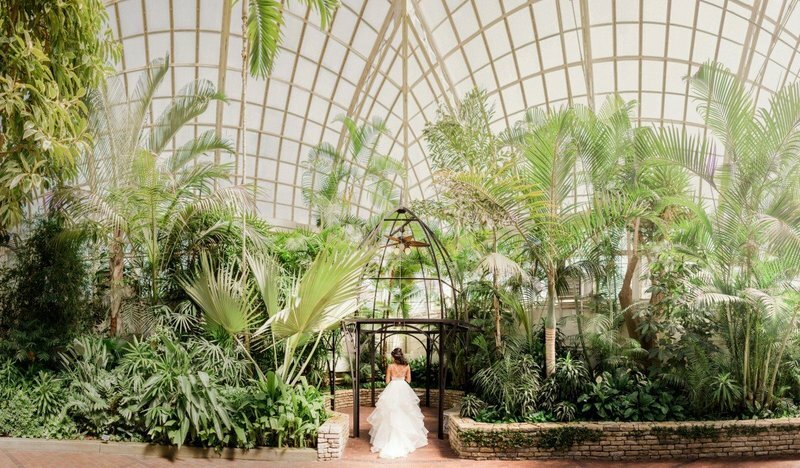 For a wedding ceremony and reception at The John F. Wolfe Palm House, you can expect to pay about $120 per person for a guest list of 125 people on a Saturday night. This does not include flowers, entertainment, additional rentals and decorations, photography and transportation, but it does cover gratuity and tax. 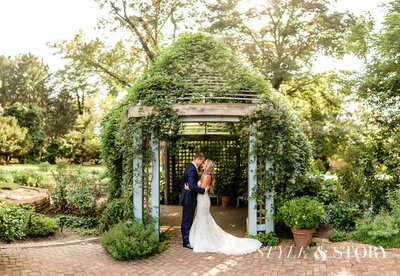 Some couples who prefer an outdoor ceremony choose the ScottsMiracle-Gro Community Garden Campus, which is a garden situated on four acres of edible plants. This spot can also be used as an area for your cocktail hour. The Grand Atrium, which features slate tile floors and plant-draped pillars, is the largest indoor space at the Conservatory. This venue is remarkably versatile, making it ideal for cocktail receptions and seated dinners. It can hold 500 guests for cocktails and 250 people for dinner. The Zen Terrace, which is a rooftop venue with an Asian theme, is included with the Grand Atrium. Featured is a bubbling fountain, along with an elegant wall and artwork by Dale Chihuly, which can serve as a lovely photo backdrop. It can also be used for a wedding ceremony. Many couples choose the Veridian for their receptions. This venue is known for its gorgeous tropical plants and glass door that ushers guests into the enchanting Brides' Garden. It makes a perfect room for smaller, intimate receptions and can hold 200 guests for cocktails and 130 people for dinner. The John F. Wolfe Palm House includes a double staircase for a bride to make her grand entrance. There are also steps that descend into a tropical garden with a Venetian fountain, along with large palms and an iron gazebo. Natural light streams into the room, thanks to the glass roof. It can house 250 people for cocktails and 190 guests for dinner. Another unique venue is The Wells Barn, which is 200 years old and has a timber, hand-constructed frame. The Wells Barn can accommodate 320 guests for cocktails and 250 for dinner. The history of The Franklin Park Conservatory began more than 150 years ago when the Franklin County Agricultural Society bought 88 acres, just two miles from downtown Columbus, Ohio. It was here that the Ohio State Fair was held in 1874. In 1884, Franklin Park was opened to the public. More than a century later, AmeriFlora '92 was held here, which was an international horticultural exposition. Several other world-class expositions followed, and today it remains as one of top venues for couples to get married. Are you a new bride looking for an extraordinary venue for your Ohio wedding ceremony and reception? If so, consider the many benefits of holding your special event at The Franklin Park Conservatory and Botanical Gardens. 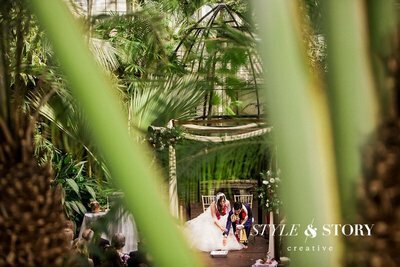 The beautiful surroundings of the Conservatory can provide you and your groom with excellent photo opportunities and lifetime memories, whether you plan to have a small, intimate gathering or a lavish, large event. Here's what you need to know about The Franklin Park Conservatory and Botanical Gardens, along with a few considerations.